Magnolia Oakland is a medical marijuana dispensary located in The Bay Area. Established in 2009, Magnolia has been proudly serving high quality medications to their patients. Some members of Magnolia’s leadership team are comprised of nationally recognized authors, activists and professors; including Ed Rosenthal and Debby Goldsberry, to name a few. From their industry pioneers to their budtenders, Magnolia Oakland is committed to providing the best possible care to their patients. Dedicated to promoting wellness and health in their community, they also offer their patients free massage therapy, acupuncture and chiropractic services. They even host senior wellness support groups and caregiver support groups so that people can connect with each other and learn healing techniques. 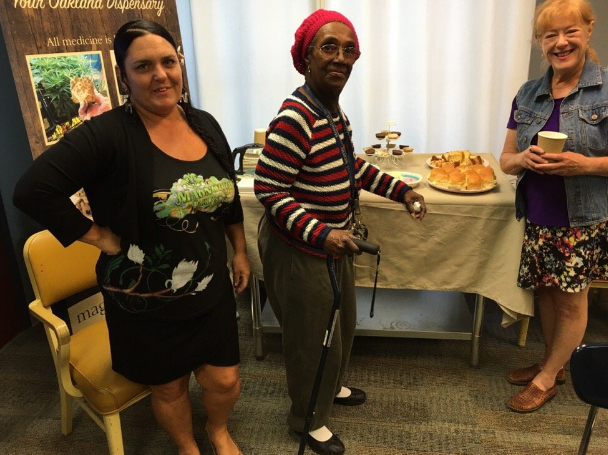 From supporting veterans to the homeless, Magnolia provides food donations to the needy. Applications for food supplementation can be submitted daily. Additionally, they offer a Compassion Program which provides medicine at no cost to to those who have HIV, Crohn's Disease, Cancer and qualify for the program. No matter what day of the week you go, Magnolia offers competitive specials that switch with each passing day and the time of the day. They also have special pricing for new patients, referrals, birthdays and more. And on top of that they offer loyalty programs to their patients. From a customer's perspective it's great. But from a Point of Sale perspective it can be a little daunting trying to find a POS solution able to handle the changing tides in an organized fashion. This is one of the many reasons Magnolia chose Cafe Cartel Systems as their POS provider. CCS effortlessly organizes specials, happy hour pricing, combo discounts and a loyalty program in an intuitive way. 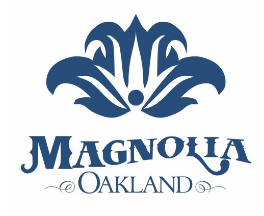 Over the years Magnolia Oakland has continued to use CCS POS and adds new licenses routinely as they expand. From metrics to limits, their integrated scales are state and NTEP approved. They use the Indica Altera 3400S, which is the easiest solution to install, setup and maintain. Their software is equally as reliable as their hardware. CCS is data encrypted and comes with features such as grow tracking, age/patient verification, blind drop functions and a powerful marijuana inventory control system. Standard POS features such as employee time clock, reporting, reconciling and labor control are also included. To see how CCS can provide a solution to meet your needs call 866-973-8099 or request a quote today. Located in Portland, Oregon is Marijuana Paradise; a tropical-themed medical and recreational dispensary. Marijuana Paradise and their staff excels at providing quality products to their patients and clientele. Their friendly and upbeat environment is increased everyday as they offer a daily trivia question. Those who can answer the question correctly receives 10% off of their order. Customers can enjoy this island vibe everyday as they are open 7 days a week. It’s no wonder why they call this dispensary Paradise! In early 2015, Marijuana Paradise was a new dispensary on the block. They had to do diligent research on their operations to ensure that they could both meet Oregon’s regulations, and compete with the local dispensaries. A solid Point of Sale solution is a key way to address both of these concerns. They requested multiple quotes from different POS companies so that they could compare multiple solutions to each other and gain a better understanding of POS in general. During this time they went to Club Sky High, an established dispensary, to see the POS they were using. Club Sky High recommended CCS POS to Marijuana Paradise as they had been using it for years. The combination of Cafe Cartel’s proven efficiency and affordability moved them to the top of their list. Cafe Cartel’s blind drop functions and management oversight minimizes employee theft and maximizes profitability. With features such as grow tracking, age verification, data encryption and a powerful inventory system, it was clear that CCS was the best point of sale system for dispensaries. When Marijuana Paradise ordered from CCS they also gained access to standard POS features such as employee time clock, reporting, reconciling and loyalty programs. This solution perfected their operations. Their integrated scales were NTEP and state approved. 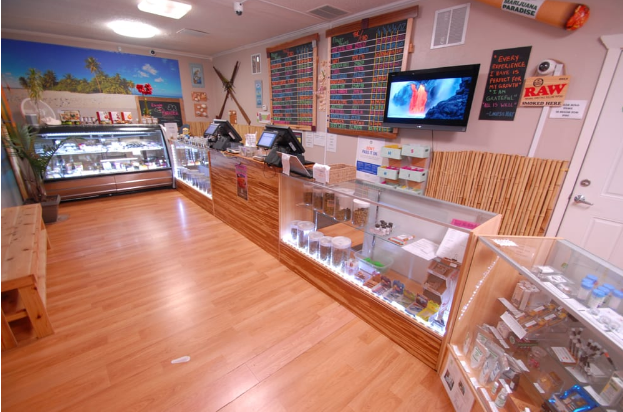 By utilizing powerful CCS POS software in combination with their reliable hardware setup, Marijuana Paradise has met all of their initial goals and more. To review your priorities with an industry consultant, please call 866-973-8099 or request a quote today. Located in Glenwood Springs, CO is The Magic Dragon. 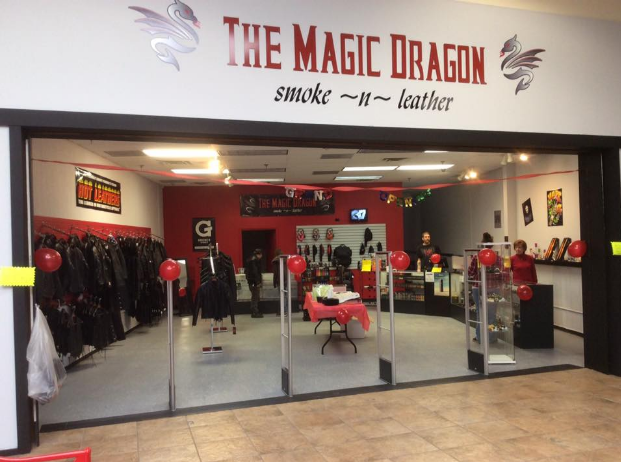 They are a fusion vape and leather biker gear shop. By being situated in Glenwood Springs Mall, loads of shoppers flood the store daily to buy organic e-juices, kits, accessories and colorado glass pipes. This is the bikers one-stop shop as they provide leather jackets, vests and chaps for those who love to ride! Though The Magic Dragon is a retail store, they’re vape as well - which means their inventory system required something more sophisticated. Inventory should be managed directly via the POS system so it was important for them to find a solution that could accommodate their needs. Many POS providers label their systems as “vape” but further research is needed to determine whether or not the system has modules designed for the vape stores needs besides just the standard retail functions. 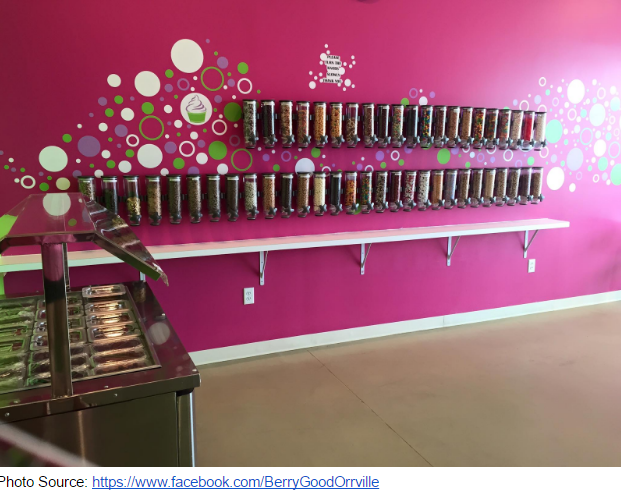 When The Magic Dragon discovered Cafe Cartel, they found a provider who revamped their software to meet the industry's needs. This meant their software could filter their buttons from liquids to brands, to flavors, then by size and strengths. This user-friendly and tidy setup requires minimal data entry and can easily manage huge lists of e-juices on the backend. CCS also handles complex kit and combo pricing in an intuitive way for the user. This makes CCS the business owner’s choice for vendor re-ordering, reporting and reconciling! The choice was easy to make for The Magic Dragon. Within no time, they had their staff trained and their system up and running. Additional features they gained access to were employee time clock, labor scheduling, age verification and QuickBooks integration. 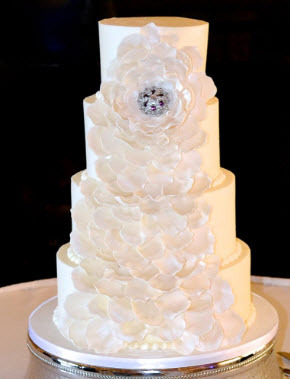 Amaru Confections is a premier custom cake and dessert shop located in Boise, Idaho. Certified chef, Aimee received her formal training from the Culinary Arts Institute in Denver, Colorado and from the top chocolatiers in France; at the Lenotre’ Institute, just outside of Paris. In 2000 she opened Amaru Confections in order to create edible works of art for special occasions including weddings, birthdays, baby showers and corporate events. 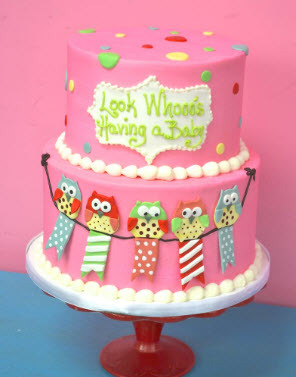 As they continued to grow, they opened a custom cake shop, retail bakery and gluten free bakery in 2013. One of their many vendors include Whole Foods Market and other local coffee shops and restaurants. The bakery offers freshly baked cupcakes, cakes and cookies. They pride themselves on using non-GMO ingredients from local vendors as much as possible - including free range eggs and unbleached flour. 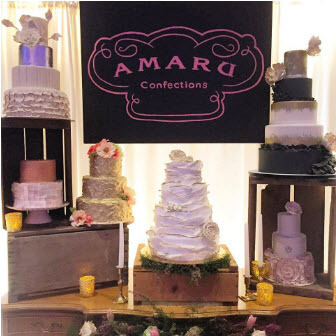 Because of their custom cakes, Amaru Confections has earned their place in the top 5% of Wedding Professionals Nationwide by Wedding Wire and Bride’s Choice Awards. CCS also includes catering, house accounts and scheduling as well. Take Production as an example: for bakers using CCS, they start their day with an interactive report that lists the items needing to be made that day and what orders the items belong to. In the report summary, employees can see the items that need to be prepped, the orders that need to be readied and the current inventory count. Items without enough stock will appear in red. This summary dictates to the staff what needs to be completed and by what time in a clear and efficient way. Once the order is readied, a time stamp will be applied and a label can be printed for the prepared product as well. Upon completion of the order, the summary will be updated and the order will be ready for pickup/payment at any time. Additionally, CCS includes features like recipe based inventory, labor scheduling, employee time clock, reconciling and reporting. Cafe Cartel has been helping bakeries succeed since 2004. To review your desired features with an industry consultant, call 866-973-8099 or request a quote today.